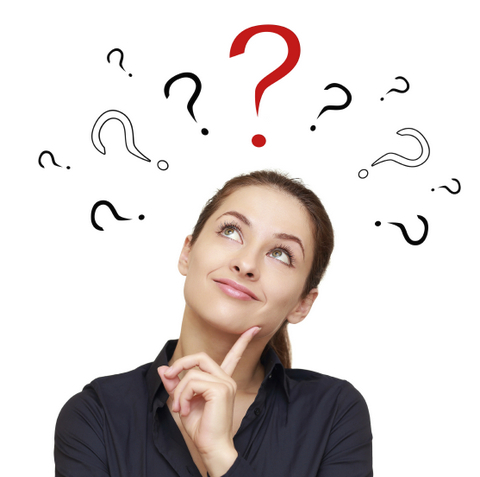 What’s the best option for processing inbound transactional data to QAD? When it comes to choosing a process for uploading transactional data to QAD ERP, depending on your business situation, time and budget, you do have your choice from several options. Let’s take a look at them and discuss the pros and cons of each. If EDI is your industry requirement and your partners expect EDI transmissions between your companies, you may not have much choice. Generally, EDI solutions are expensive and require sufficient resources to maintain. 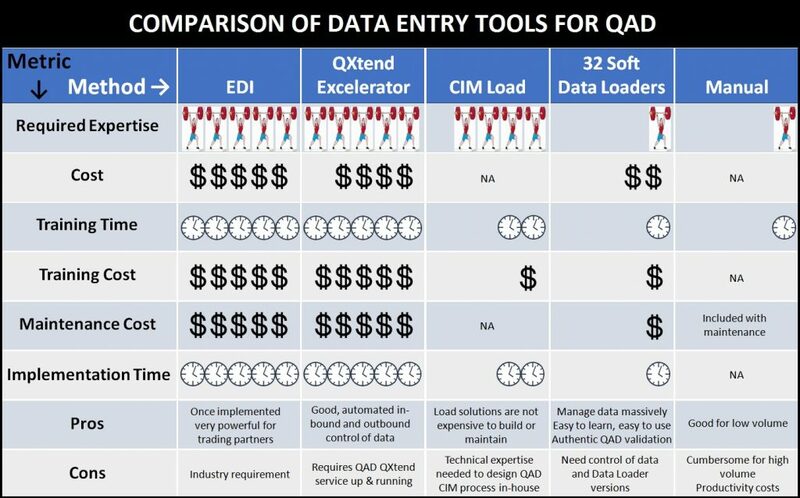 Qxtend and QXtend Excelerator are QAD products that act as a framework or engine that enable data interchange between QAD and any other system or application. Excelerator enables MS Excel integration and requires QAD QXtend service to be up and running. QXtend has a sophisticated multi-layer structure that is built to work with virtually any data format for both inbound outbound loads. Solutions based on QXtend are generally expensive and require many internal IT and external QAD consultant resources to implement and maintain. Another possible solution is to design your own process based on QAD CIM load. QAD users who have technical expertise in this area sometimes choose to design the QAD CIM process in-house. Others hire QAD consultants for this purpose. Generally, CIM Load solutions are not expensive to build or maintain. However, there are some limitations to CIM load solutions, which could lead to bigger issues. Since CIM load solutions do not have immediate data validation, there is a chance that uploaded data may cause the creation of garbage records in QAD. Another disadvantage of CIM load solutions is the need to give users access to the QAD 36.15 CIM Load Interface menu. Doing so contradicts Sarbanes-Oxley (SOX) security regulations, and your company may be questioned during SOX security audits. Data Loaders are easy-to-use, safe tools built specifically to give QAD business users a quick and easy way to perform volume updates or transactions in QAD from Excel-based files. Data Loaders are ready-to-use and can be enabled in your QAD system within a few minutes. They are affordable to both buy and maintain, but provide so much value to your business by releasing your IT staff or QAD consultants from the burden and expense of managing uploads to and downloads from QAD. All of our Data Loaders have an instant data validation feature that uses genuine QAD logic. Not only are erroneous values highlighted in your data prior to uploading to QAD, but a detailed description of the error is also provided. Data Loaders’ record lock feature notifies the user if any of the records on the spreadsheet are locked in QAD by another user. So your screen never gets locked up with the message that someone is holding the record. The ability to make quick and easy massive data changes and additions to QAD coupled with Data Loader’s built-in QAD security, SOX compliance, and instant data validation, make Data Loaders very attractive for QAD users. Your QAD business users get simple yet powerful tools for safely managing volume ERP data such as Sales Orders, Purchase Orders, Customer and Supplier Schedules, Price Lists, Item Master, BOM’s, Routings, Forecast, Inventory, Backflush transactions and many more. Data Loaders will enable you to significantly speed up business data processing in your company and transform your business operations—saving hundreds or thousands of labor hours a year. That’s not our opinion. It’s fact. Check out the Case Studies. You’ll be able to more quickly and accurately process customer orders, adjust schedules, track and manage inventory and supply chain, close fiscal periods, order materials, build your production plan with confidence, and much more. We have dozens of available Data Loaders for every major QAD data management module. Learn more about how Data Loaders can improve your business by contributing to your bottom line. For a full list of available Data Loaders, click here.